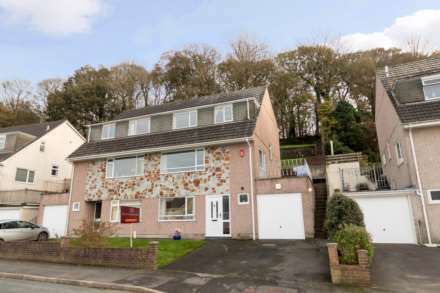 A deceptively spacious family home with panoramic views over the surrounding area taking in Hooe Lake. The extended accommodation comprises; spacious lounge/diner enjoying panoramic views, large fitted kitchen/breakfast room, two double bedrooms and a family bathroom on the ground floor, there is a fixed staircase to the loft which has been boarded and has a skylight which has previously been used as a third bedroom, on the lower ground floor there is a separate utility room and a garden room which has previously been used as bedroom four boasting an en suite shower room. Outside is an enclosed rear garden and off street parking is provided by a driveway. Offered with no chain, an internal viewing of this property is highly recommended to fully appreciate the size of the accommodation on offer. Entrance door into the entrance hall with single radiator. Double glazed window to the front. Doors into the ground floor bedrooms, living room, kitchen/breakfast room and bathroom. Measurements widen to 12ft 9in (3.9m) at one end. Double glazed windows to the rear providing panoramic views over the surrounding area taking in Hooe Lake. Feature fireplace. Two radiators. Plus a further area of 9 ft 7 in x 9ft 2 in (2.92m x 2.80) at the breakfast end. Measurement at the breakfast end includes stairs to the lower ground floor. Fitted kitchen with a range of base and eye level storage cupboards. Roll edge work surfaces. One and half bowl sink and single drainer with mixer taps. Tiled splasbacks. Built in oven and gas hob with extractor hood. Stairs to the lower ground floor landing. Plumbing for dishwasher. Two radiators. Breakfast bar. Double glazed window to the front. Range of fitted wardrobes along length of one wall. Radiator. Double glazed window to the front. Single radiator. Understairs storage cupboard. Suite comprising: Bath with separate shower shower unit over. Pedestal wash hand basin. Low flush WC. Tiled walls. Obscure double glazed window. Double radiator. Storage cupboard. Previously used as the third bedroom. Double glazed skylight provides panoramic views looking towards Hooe Lake. Double radiator. Under eaves storage. Steps provide access to utility room. Double glazed door to the rear garden. Base level cupboards with roll edge work surfaces. Stainless steel sink and single drainer with mixer taps. Gas boiler. Plumbing for washing machine. Access into a storage cellar. Door leads through to the garden room. Restricted head height. Previously used as bedroom four. Double glazed double doors to the rear garden. Single radiator. Storage cupboard. Door into the ensuite. Shower cubicle and shower unit. Low flush W.C. Wash hand basin. Tiled splasbacks. Low maintenance garden with paved patio. Timber built storage shed. Driveway providing off street parking.